The Taoiseach, Leo Varadkar, is in New York to take part in a series of events marking the launch of Ireland’s election campaign for a non-permanent seat on the UN Security Council for the 2021-2022 term. He is being accompanied by the Tánaiste and Minister for Foreign Affairs and Trade, Simon Coveney. Our bid for a seat on the Council is an important element of Global Ireland 2025, the recently launched strategy to double the scale and impact of Ireland’s international presence. Ireland goes forward for election to the Security Council at roughly 20 year intervals. We are competing with Canada and Norway for one of two seats available. 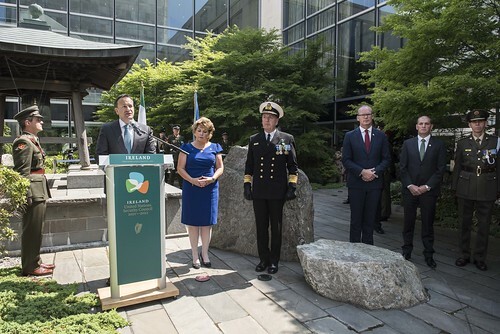 The Taoiseach will participate in a ceremony to commemorate the 60th anniversary of Ireland’s participation on UN peacekeeping operations, and pay tribute to the 88 members of the Defence Forces who lost their lives while on UN service. The Taoiseach and Tánaiste will officially launch Ireland’s campaign at UN headquarters with a special event celebrating Irish food, music, heritage and culture. The launch will be supported by former President of Ireland Mary Robinson and U2’s Bono. Over 400 UN diplomats and other guests have been invited to attend the reception on the UN’s North Lawn, beside the ‘Arrival’ sculpture, by Irish artist John Behan, which was gifted to the UN by Ireland in 2000. Ireland’s campaign for a seat on the UN Security Council is central to our international agenda, and is driven by our belief that we are far stronger acting together than we are acting alone. During more than six decades of UN membership, Ireland has played a leading role as a small member state that is vocal, active and courageously committed to peacekeeping, humanitarian assistance, disarmament, sustainable development, personal freedom, free trade, democracy, the rule of law and human rights. Winning a seat on the UN Security Council would place Ireland at the heart of UN decision-making on international peace, security and development. It would also continue Ireland’s proud tradition of international engagement dating back to our admission to the UN in 1955. We will have a tough campaign on our hands over the next two years and we certainly don’t underestimate our competition, but I am confident that by putting our full support behind the campaign and by emphasising Ireland’s unique strengths and track record, we can succeed. We are looking to serve on the UN Security Council over 2021-22 because we believe in a strong UN and we want to be at the centre of it, advocating for our core values. We have unique perspectives to bring based on our experiences in areas like peacekeeping, conflict resolution and international development. And ‘Global Ireland’ is about more than just advancing our prosperity - it is also about promoting our values and making this a safer, more secure and more sustainable world. The Taoiseach will host a business network lunch with the Irish Consulate with young Irish people working in New York across a range of sectors including media, finance and tech. He will also meet with participants in the recently established New York branch of the Washington Ireland Programme. On his return to UNHQ, the Taoiseach will hold a meeting with the African UN Permanent Representatives. As part of their support for Ireland’s campaign, U2 hosted international diplomats based at the UN at a concert in Madison Square Garden. The Irish Government delegation was also in attendance. The Taoiseach will conclude his visit on Tuesday morning by meeting a group of business leaders, investors and entrepreneurs supported by IDA Ireland and Enterprise Ireland at the New York Stock Exchange.